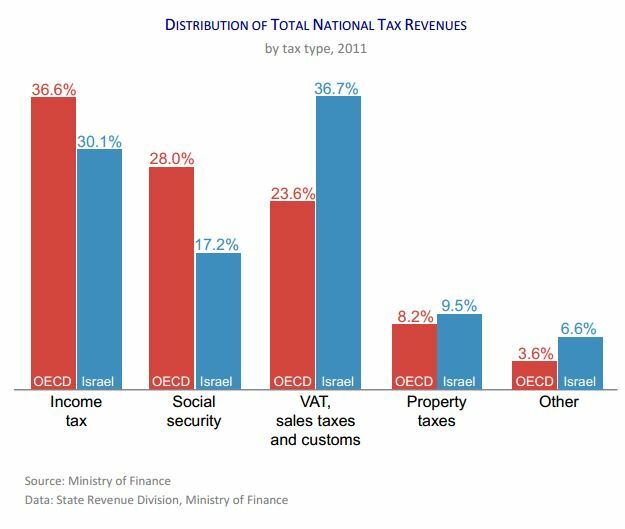 Differing sources of tax revenues in Israel and OECD: The composition of Israel’s tax revenues differs from the OECD average, with a greater emphasis placed on indirect taxes (value added tax, sales taxes and customs) than on direct income taxes. Indirect taxes are considered a more regressive form of taxation since poorer individuals tend to spend a greater share of their income on consumption. Consequently, their indirect tax expenditures tend to constitute a greater share of their income. The lower revenues from social security taxes in Israel are the result of low contributions from Israeli employers (1.5% of GDP in Israel compared to 4.8% of GDP in the OECD in 2011). On the other hand, social security taxes paid by Israeli wage earners are 3.8% of GDP, compared with 3.1% of GDP in the OECD.